It is not reef-safe, as it will eat corals, tubeworms, other starfish and sponges. It is otherwise peaceful towards tankmates. It should not be kept with fish that may nip it, such as Triggerfish. 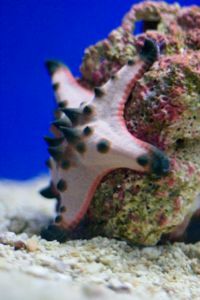 A peaceful starfish as long as you're not a reef-dweller such as soft corals, clams, sponges, tubeworms or other starfish, which it will eat. This page was last edited on 8 August 2011, at 11:24.